The ice from the ice storm is thick—easily ¼” and possibly more—and everything is weighed down by it. Birch branches, pine boughs, saplings—all are bent over and strained by the tremendous weight of the ice. Two days and a night of unseasonably warm weather, followed by a calm stretch, brought on the ice storm. Now it’s three days later, and the blizzard has hit. I catch up to the deer on my snowshoes, following an indirect route across the fields and to the forest edge where I hope to get an alternative perspective. The blizzard has already dropped five inches or more of snow, but the going is surprisingly easy—thanks in part to the layer of crunch underneath put down by the ice storm, which help my snowshoes get a grip. The deer tolerate my presence; they’ve seen me before. It’s a doe and her yearlings—fawns from last spring—who are attempting to travel and browse despite the snowy conditions. The footing is a challenge for them, as their hoofed feet punch through the ice layer with each step. 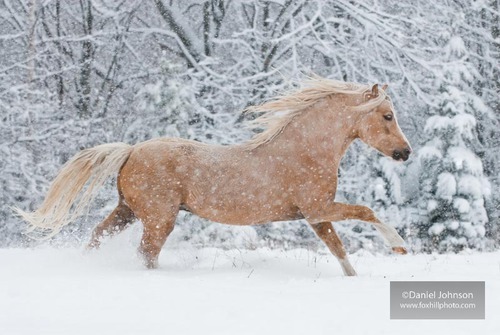 Their backs collect snow, which doesn’t melt from their body heat because their coats provide excellent insulation. They move slowly, carefully. But for all its difficulties, the severe weather has actually done them a favor. The branches of pine trees—still sagging from ice that won’t melt—are hanging lower than they normally would, perhaps several feet lower. This puts a large amount of potential food—that the deer wouldn’t typically be able to browse on—into reach, and they’re taking advantage of this surprise free meal. 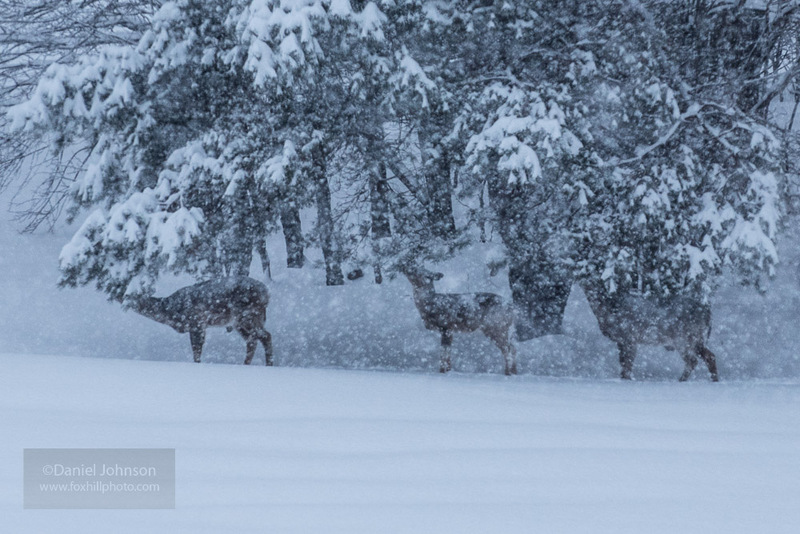 All three deer work the area—walking carefully—moving from tree to tree, ignoring the blizzard and enjoying the pine needles. It appears to be a good winter snack. The deer alternate between eating and watching me. I alternate between lens choices: a fixed 500mm for long-distance close-ups, and a versatile 70-200mm zoom for wider environmental shots. 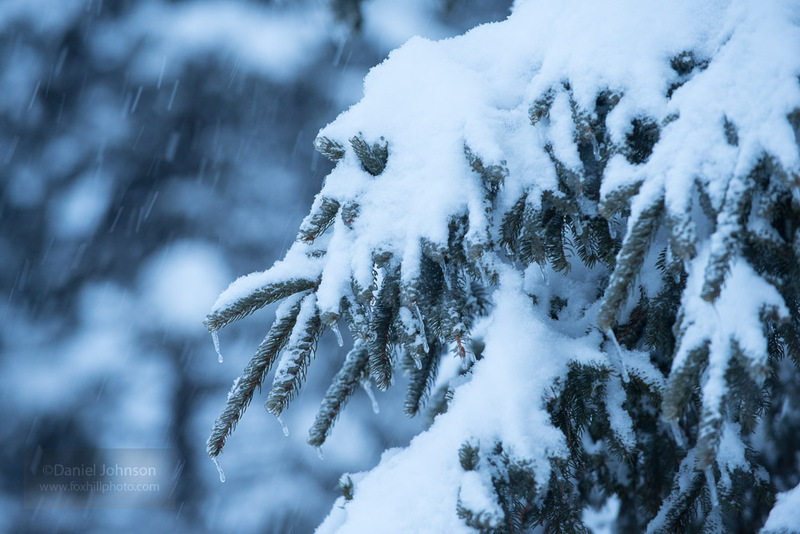 The compression effects of these long focal lengths can be used to accentuate the blizzard and make it appear even more intense. 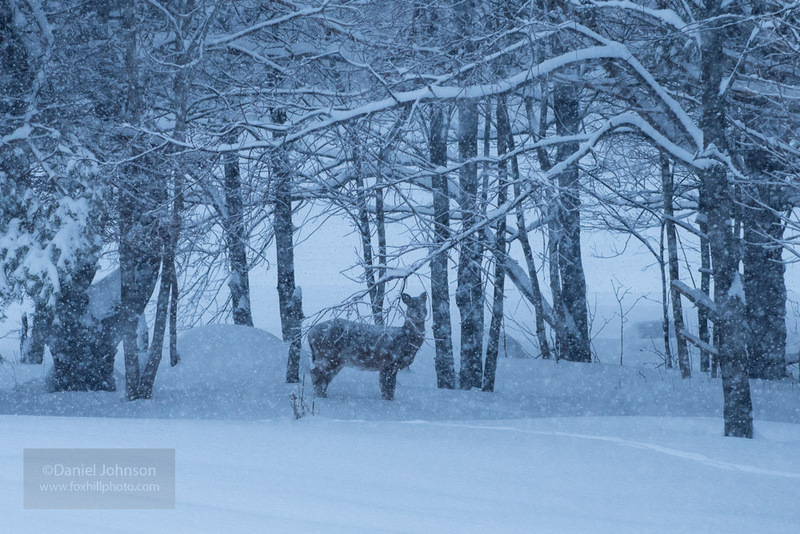 I also alternate between shooting video and still photos; both can be used to illustrate the heavy snow and the deer’s situation in different ways. It’s getting dark now—due to it being the end of a short winter’s day and also from the heavy cloud cover and snow. As I get closer—actually walking through the recent tracks of the deer—they finally decide to move on, quickly and almost silently disappearing into the thicker growth of the young forest where they “yard up” in areas protected from the wind and deep snow. I retreat as well, and make it back to the safety and warmth of the house. At the end of the day, all of us seem happy enough: the deer are full from browsing and my camera card is full from shooting.